This site is always evolving and I hope you and your child have found it of some use. If you have any sites that you and your family find useful please let me know and I can add them below. Many thanks for your continuued support. 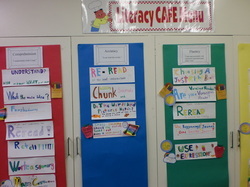 In class, we have discussed various reading strategies and have grouped the strategies on our C.A.F.E. chart. C.A.F.E. is an acronym for Comprehension, Accuracy, Fluency, and Expanding Vocabulary. Below are several links that pertain to some of the strategies that will be discussed. Please feel free to downnload them at your leisure. This resource offers a complete step-by-step guide to many options for handling over 100 child problem behaviors. You can learn how to to handle discipline concerns effectively, keep yourself in control of the situation, and teach children self-discipline for the future. Click on the picture on the left to visit the website.